IRAQI GOVERNMENT AND Kurdish forces, backed by US-led coalition air and ground support, launched coordinated military operations early today as the long-awaited fight to take the northern city of Mosul from Islamic State (IS) fighters got underway. Convoys of Iraqi, Kurdish and US forces could be seen moving east of Mosul in the early hours of today. Along the front line, US-led coalition airstrikes sent plumes of smoke into the air and heavy artillery rounds could be heard. Iraqi Prime Minister Haider al-Abadi announced the start of the operations on state television, launching the country on its toughest battle since American troops left nearly five years ago. Mosul, Iraq’s second largest city, has been under IS rule for more than two years and is still home to more than a million civilians, according to UN estimates. “These forces that are liberating you today, they have one goal in Mosul which is to get rid of Daesh and to secure your dignity. They are there for your sake,” al-Abadi said, addressing the city’s residents and using the Arabic language acronym for the Islamic State group. “God willing, we shall win,” he added, dressed in the uniform of the elite counterterrorism forces and flanked by military commanders. The push to retake Mosul will be the biggest military operation in Iraq since American troops left in 2011 and, if successful, the strongest blow yet to IS. A statement on Al-Abadi’s website pledged the fight for the city would lead to the liberation of all Iraqi territory from the militants this year. In Washington, Defence Secretary Ash Carter called the launch of the operation to liberate Mosul “a decisive moment in the campaign” to deliver a lasting defeat to IS. He said the US and other members of the international coalition stand ready to support Iraqi and Kurdish forces. Iraqi forces have been massing around the city in recent days, including elite special forces that are expected to lead the charge into the city, as well as Kurdish forces, Sunni tribal fighters, federal police and Shiite militia forces. South of Mosul, Iraqi military units are based at the sprawling Qayara air base, but to the city’s east, men are camped out in abandoned homes as the tens of thousands of troops massed around the city have overwhelmed the few military bases in the area. Kurdish forces are stationed to the north and east of Mosul, a mostly Sunni city that has long been a centre of insurgent activity and anti-central government sentiment after the US-led invasion of Iraq in 2003. Iraqi officials have warned that the Mosul operation has been rushed before a political agreement has been set for how the city will be governed after IS. 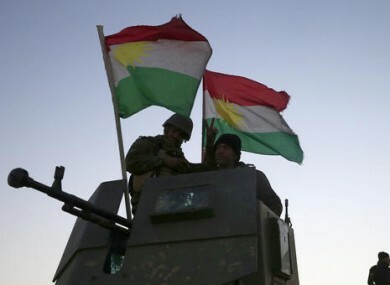 Lieutenant Colonel Amozhgar Taher with Iraq’s Kurdish forces, also known as the Peshmerga, said his men would only move to retake a cluster of mostly Christian and Shabak villages east of Mosul and would not enter the city itself due to their concern for “sectarian sensitivities”. “To eliminate the threat we must eliminate (IS) from Mosul,” Taher said at a makeshift base in an abandoned house along the frontline some 30 kilometers (19 miles) east of Mosul. The city fell to IS fighters during the militants’ June 2014 blitz that left nearly a third of Iraq in the extremists’ hands and plunged the country into its most severe crisis since the US-led invasion. After seizing Mosul, IS leader Abu Bakr al-Baghdadi visited the city to declare an Islamic caliphate that at one point covered nearly a third of Iraq and Syria. However, since late last year, the militants have suffered battlefield losses in Iraq and their power in the country has largely shrunk to Mosul and small towns in the country’s north and west. Mosul is about 360 kilometers (225 miles) northwest of the capital, Baghdad. The operation to retake Mosul is expected to be the most complex yet for Iraq’s military, which has been rebuilding from its humiliating 2014 defeat. Lieutenant General Stephen Townsend, commander of Combined Joint Task Force Operation Inherent Resolve, said in a statement that the operation to regain control of Mosul could take “weeks, possibly longer”. Earlier, Iraqi Brigadier General Haider Fadhil told the Associated Press in an interview that more than 25,000 troops, including paramilitary forces made up of Sunni tribal fighters and Shiite militias, will take part in the offensive that will be launched from five directions around the city. The role of the Shiite militias has been particularly sensitive, as Nineveh, where Mosul is located, is a majority Sunni province and Shiite militia forces have been accused of carrying out abuses against civilians in other operations in majority Sunni parts of Iraq. Fadhil voiced concern about potential action from Turkish troops based in the region of Bashiqa, northeast of Mosul. Turkey sent troops to the area late last year to train anti-IS fighters there. But Baghdad has seen the Turkish presence as a “blatant violation” of Iraqi sovereignty and has demanded the Turkish troops withdraw, a call Ankara has ignored. Military operations are also predicted to displace 200,000 to a million people, according to the United Nations. Just a few kilometers from the eastern front line, rows of empty camps for displaced civilians line the road, but aid groups say they only have enough space for some 100,000 people. “It is the future of Iraq at stake,” said Aleksandar Milutinovic, the Iraq country director for the International Rescue Committee. He stressed that the population of Mosul is not all supporters of IS, “they’re just people who had no other opportunity or a place to go” and urged Iraqi forces to “show will and a very serious commitment to protecting civilians and ensuring their wellbeing”. Email “The battle to retake Mosul from Islamic State has begun ”. Feedback on “The battle to retake Mosul from Islamic State has begun ”.